Blue Water Charters offers a variety of fishing trips out of Durban, South Africa. 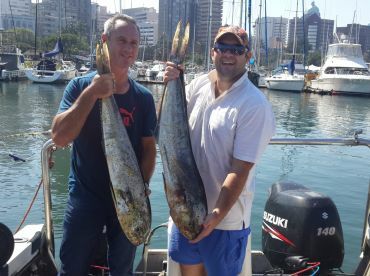 They are specialists in Marlin and big game fishing and have the highest catch rates in Durban. 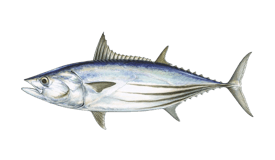 Here, you can catch the likes of Tuna, Marlin, Trevally, Yellowtail, Mackerel, and much more. To get them, you will need an experienced crew by your side. 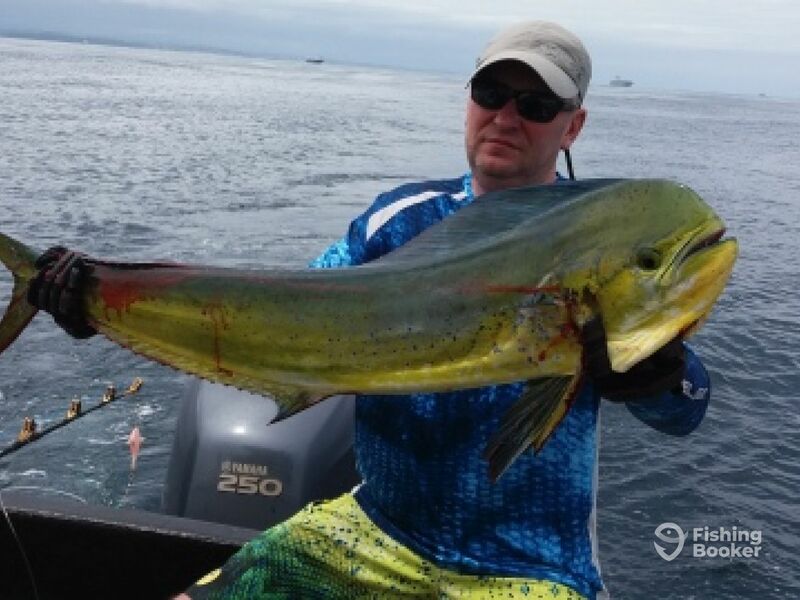 Luckily, Blue Water Charters are fit to fish for game fish. They will assist you whichever the package you book. Mike is the owner and a fisherman himself. 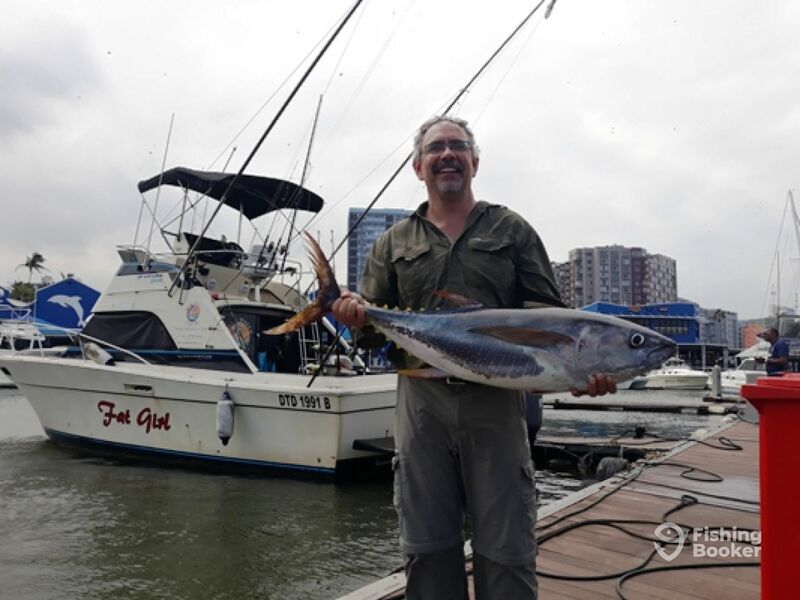 He has penned articles in numerous fishing magazines and knows the local waters. 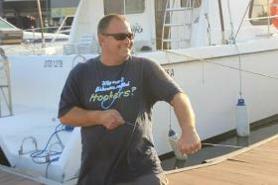 Your regular skipper, Eric, is also skillful and knowledgeable. Both of them know how to go about hefty fish. 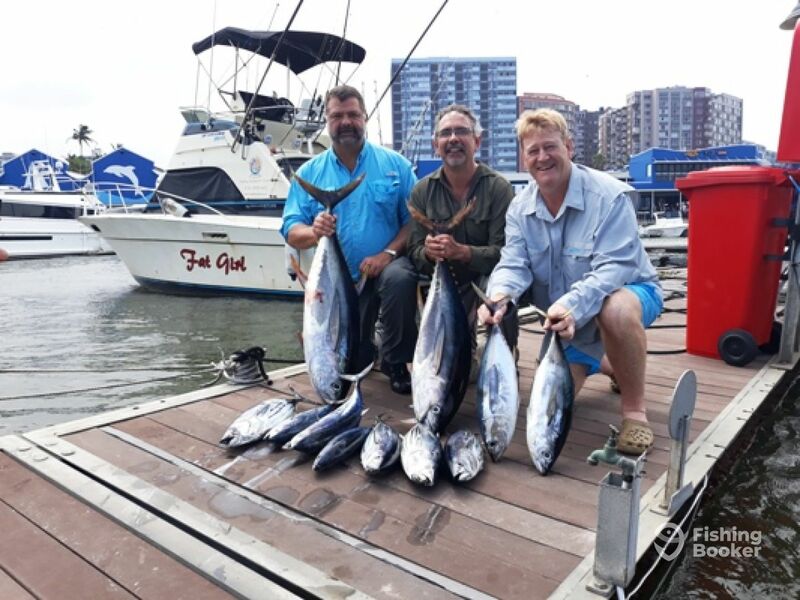 Blue Water Charters are pros at going after Marlin and other big game fish, being one of the charters with the highest catch rates in Durban! 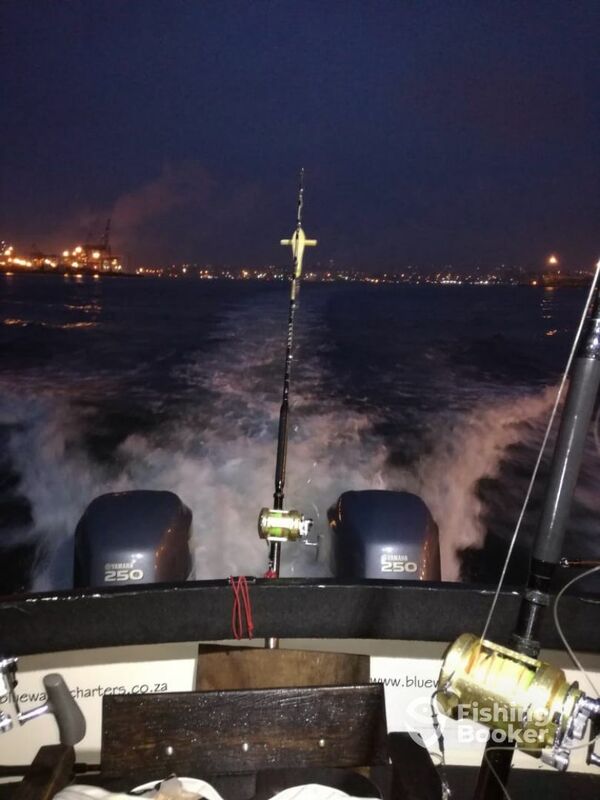 The boat is fully equipped to go after the sea-spraying prestigious monster Marlin – fighting chairs, high-quality equipment and, true fisherman’s spirit are all there to help you get that dream catch. To ensure a customized experience, the crew offers a variety of packages. 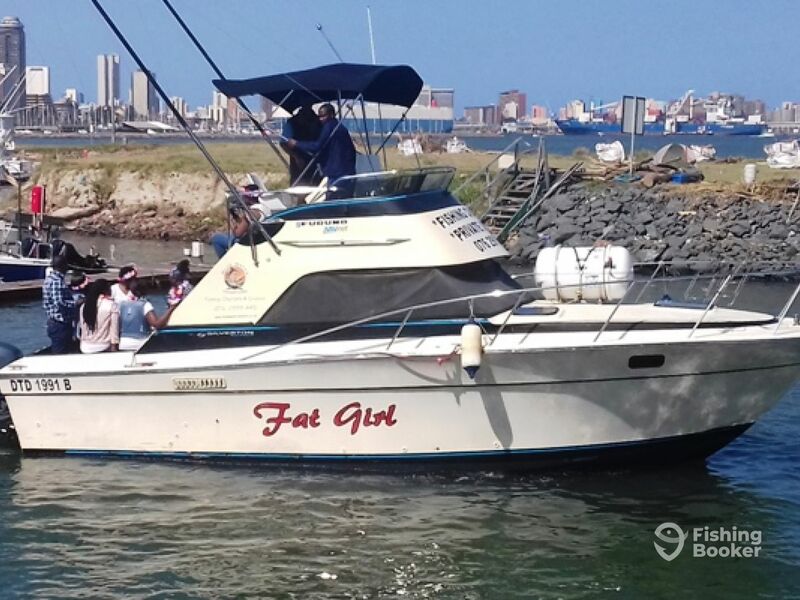 They will accommodate you aboard their 34’ Silvertson Sport Fisher, named Fat Girl. 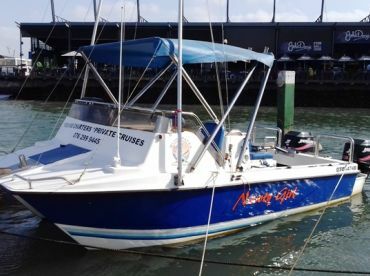 The vessel features a 12’ beam, has a cabin with a lounge area, a galley, a hand wash basin, and a flush toilet. The boat is powered by two 250 HP Yamaha 4 stroke engines, with a maximum cruising speed of 30 knots. Once onboard, you will find a spacious aft deck with padded gunnels and a fighting chair. There is a large foredeck and flybridge. The boat is rigged with Garmin GPS, and Furuno Sonar, a good sound system, and it has outriggers and downriggers. Simply put, it’s made for fishing. Whether it’s deep seas, inshore, reefs, vertical jigging, spinning or fishing on the fly, they’ve got you covered. You will get top-notch tackle by Shimano Tiagra. Take out a fishing license in one of the tackle shops. Food and drinks are available at an extra cost. 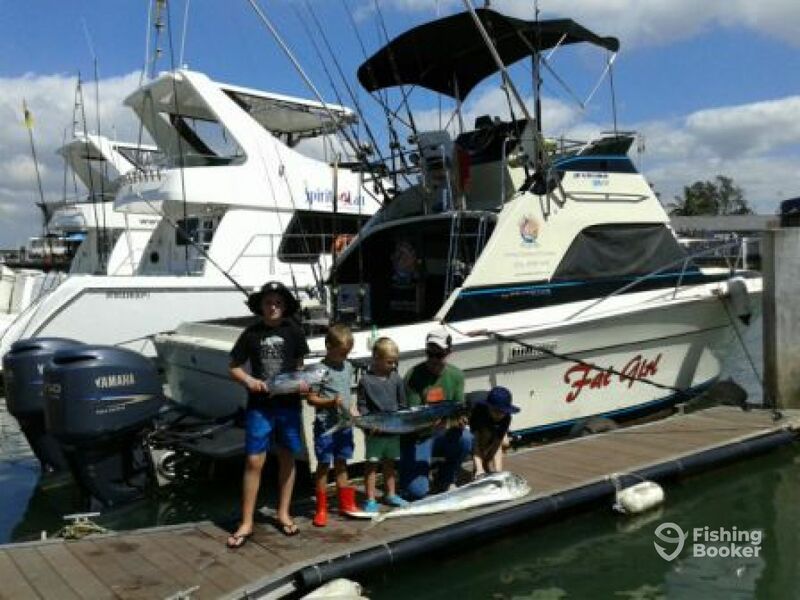 Hop on and let Blue Water Charters take you out! 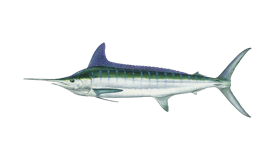 This is a slow trolling or live bait drifting trip to target various inshore species according to the season and conditions. 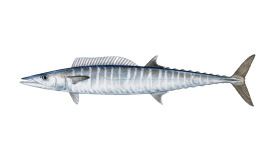 Species that can be targeted are Queen Mackerel, King Mackerel, Yellowfin Tuna, Bonito, Kingfish, Queenfish, Garrick and other species that venture inshore on occasion like Sailfish. 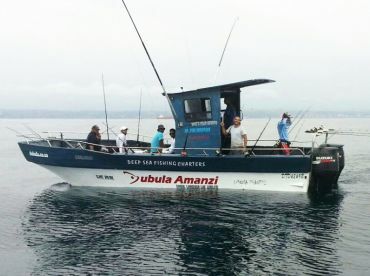 The area usually fished is in the shallow waters from the Harbour mouth to the Bluff South of Durban. 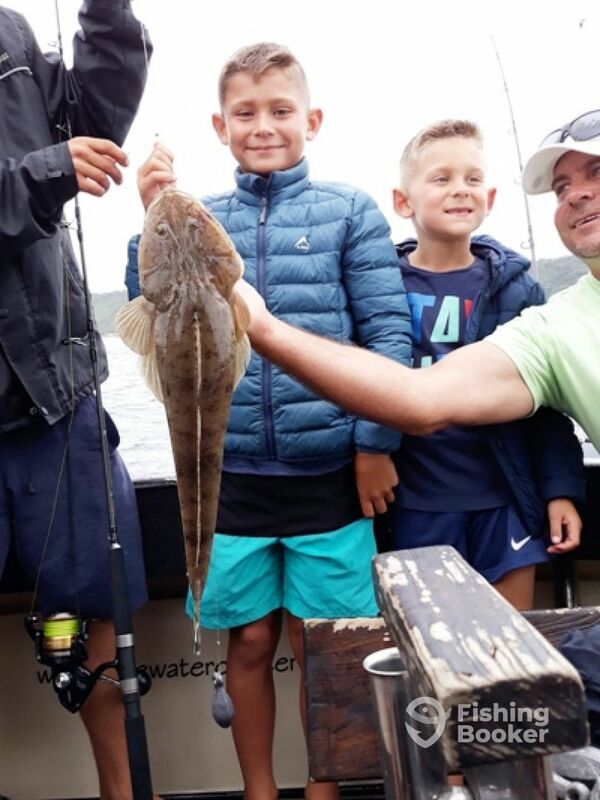 All tackle and bait is provided with help from the crew. 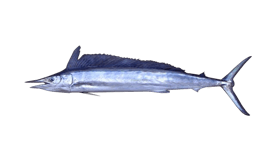 Live bait is caught at the start. 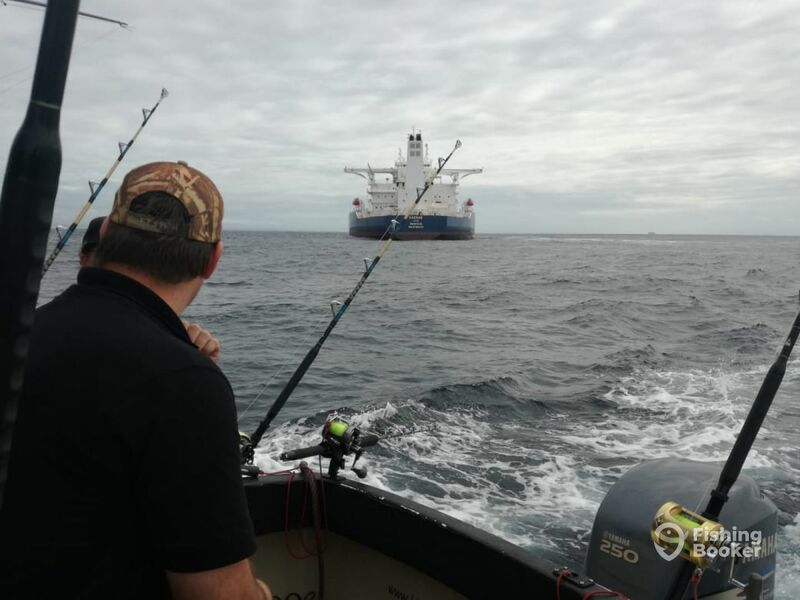 Silverton (Offshore sport fishing) построена в 1979, обновлена в 2015. Мотор – 2 250 л.с. Yamaha 4 strokes, максимальная крейсерная скорость – 30 узлов. I contacted Mike Captain of Fat girl and smaller boat/s, last year and we decided this week was going to be great. Kurt is his 1st Mate, and a highly talented all round sportsman. Monday, the sea was gorgeous, but blank. Wasn’t worried and Tuesday again left at round about 5am. Went around 40-50kms out to Mozambique Channel, and temp of water was not around 24 degrees - perfect. 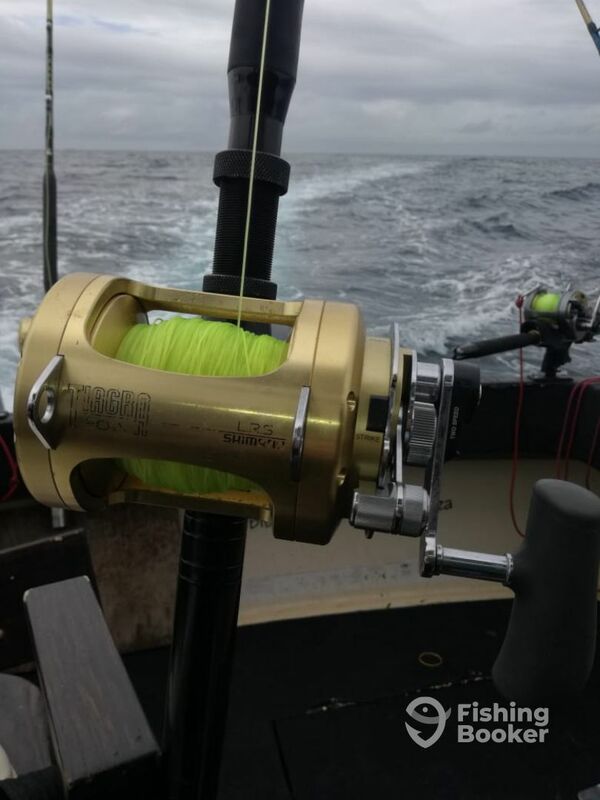 No action for couple of hours and had a very strong hit on Beautiful Kona head ( we had 9 top class rods and reels , with about 1km of braided line , and half (on the top) another few hundred meters of Dacron. 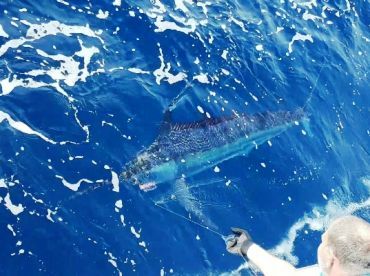 As the reel steamed off Marlin jumped and Kurt and I saw first first half body of this Black Marlin! 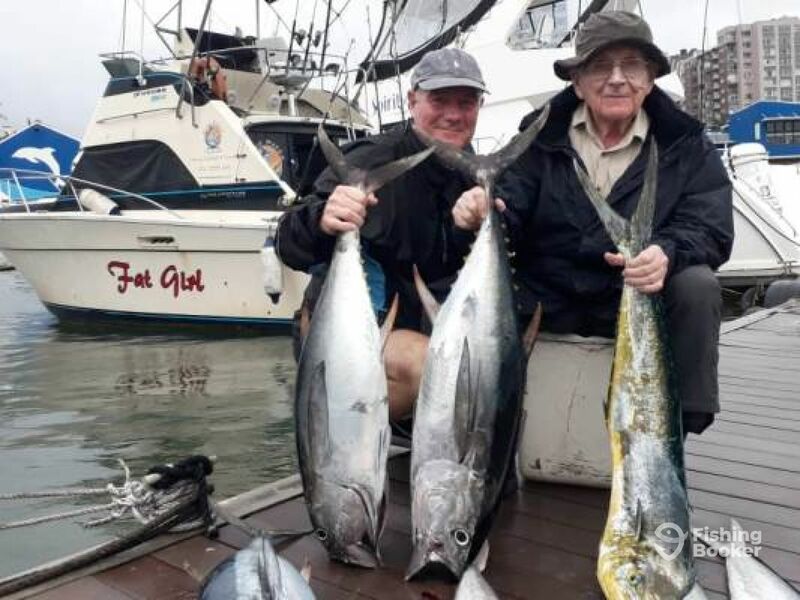 It was enormous, and he took 700metrrs of line in about 20 seconds and nearly emptied spool of line on the gorgeous Reel ( Shimano Tiagra’s on all top of the range rods. Had put 12kgs drag on reel. He jumped again , and was violently shaking. Kurt put rod on shoulder, to help me. I wasn’t excited and focused on fight. I fought it for just under an knew would be few hours fight. Suddenly he turned at same take off speed towards boat and dropped the Kona. Guesstimates are around 350kgs. Obviously we were disappointed, but hooked my dream Fish after 40 years of trying. My accomadation was kindly provided by Ed on his 1200hp outboards, and also absolute gentlemen like Deon . 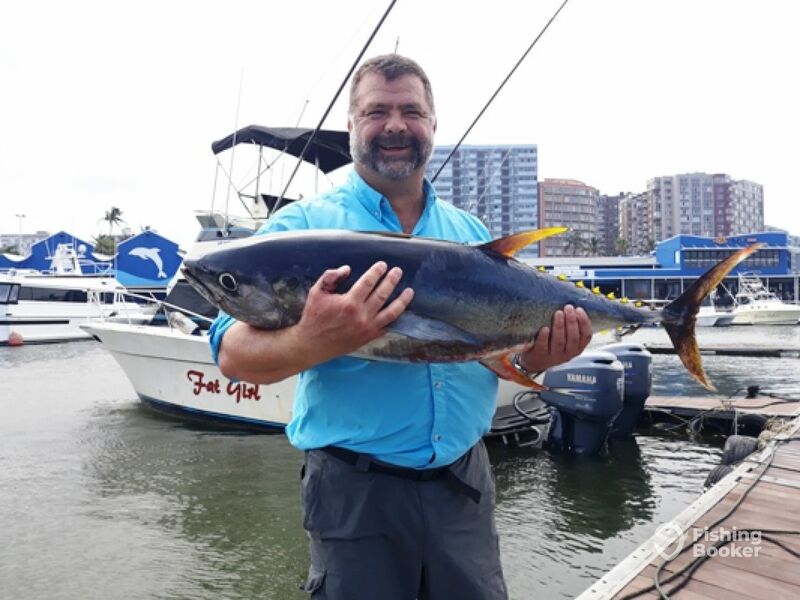 On way back hit two love yellow fin Tunas, filled by a bull and Queen Dorados. My sincere thanks to all - Mike unreal and such high Integrity with Deon Ed and Kurt . 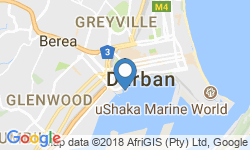 If you want to contact me for verbal truth and absolute summary - 0711716149. 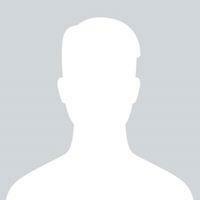 O am not an agent for any bookings but above sums it! Mike and his deckhand Kurt were extremely professional. It was the first time out to sea for most of our group and we all had a great time and look forward to coming back again. We left the bay at 6am to fish the backline but with the dredger busy in that area Mike knew it would be better to head further out to deeper water where we could secure some better fish. We picked up a lot of sand soldier which eventually became a nuisance so Mike moved us along to a better spot where we were rid of the peckers. 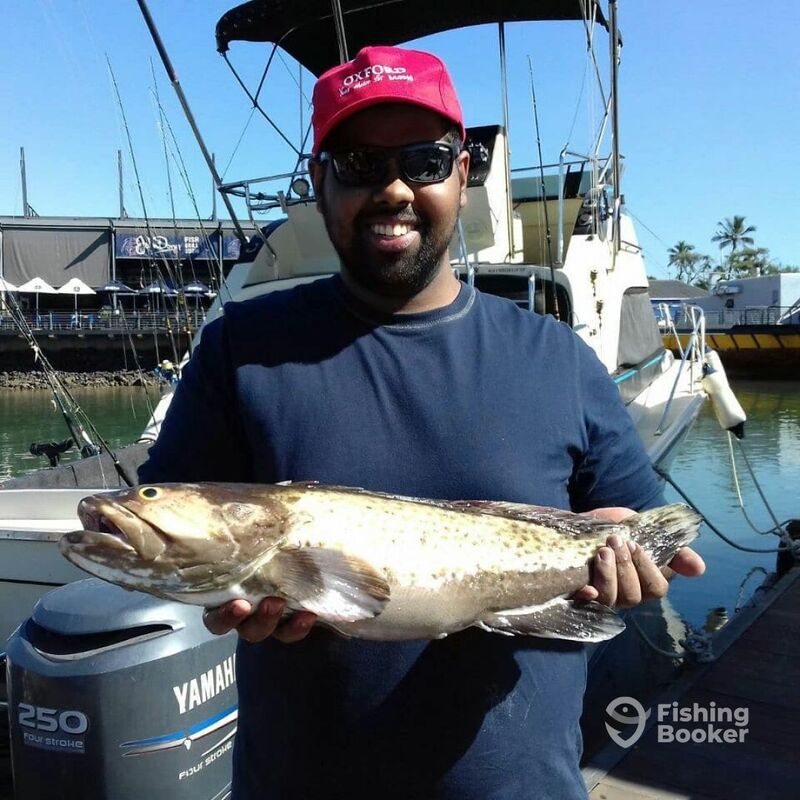 I personally managed a good size rockcod, a personal best fish and a great fight on the light spinning gear we were using. Other good eating fish of size were a copper bream, englishman and slinger. 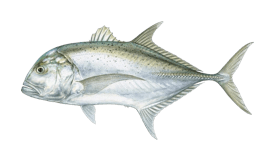 We also got a few undersize fish off the reef which were released and lots of trigger fish, banana fish, lizard fish and other by catch which was some fun to reel in but unfortunately didn’t alllow us to keep our bait in the water for longer to give the bigger fish a chance to eat. 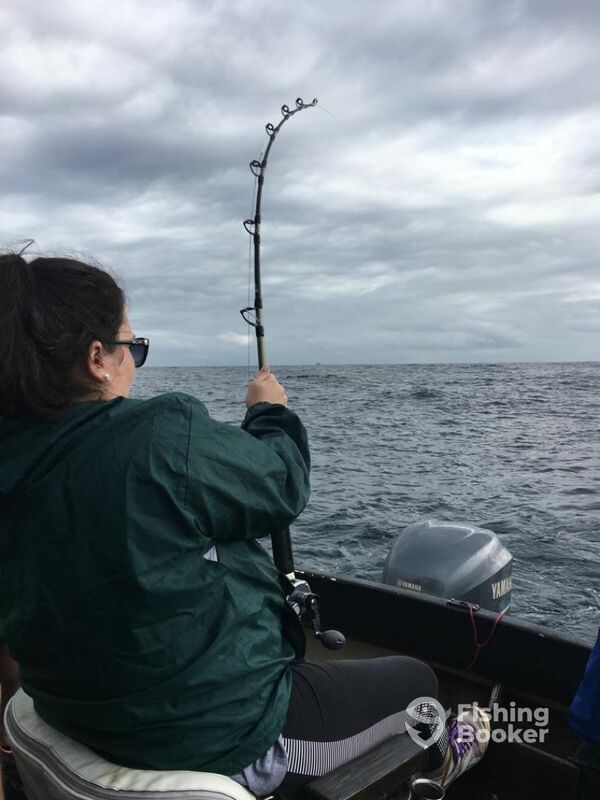 Unfortunately despite the great conditions the bigger fish were just not interested in taking a chomp. All in all a great time and an excellent trip with excellent guidance by the crew, I highly recommend a trip with Mike and look forward to heading out with him again. 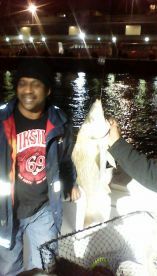 First deep sea fishing experience a great one! The sea was rough, turned me inside out. But what a great morning of deep sea fishing! It was the first time for our group of 4, but Mike and Kurt were great! 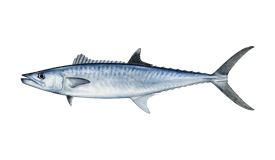 They got us onto some good Oceanic Bonito, landing the majority of them. Professional setup with quality gear. These guys know what they’re doing, which put us at ease. Thanks for the great trip guys, we’ll be back! Thanks for the review Craig. 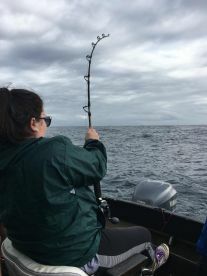 Although the sea was not flat it was actually not rough but what we call very nice seas, but yes compared to fishing on a dam it can be daunting. 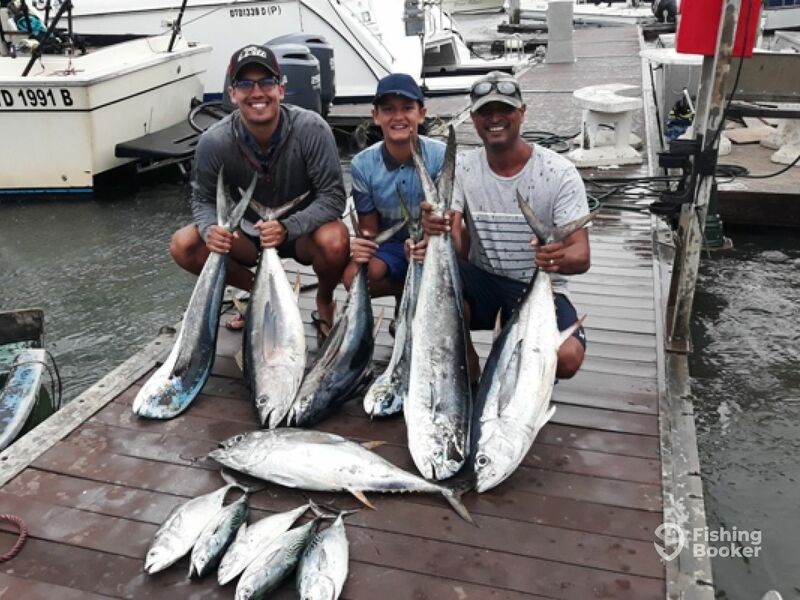 Those Bonitos would not leave us alone and we could never get all our lines out before we had another hit, it is not every day that we get hit after hit after hit with so much action. Hope to see you soon. 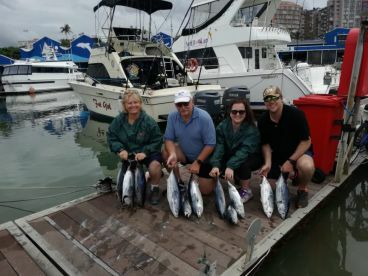 Once the weather was permitting good fishing, we had a great trip with Mike and Coert. They both went the extra mile to make our trip a memorable one. Another bucket list item crossed of our list. 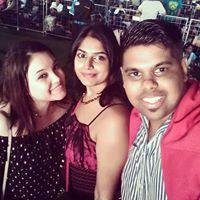 The day out was awesome. 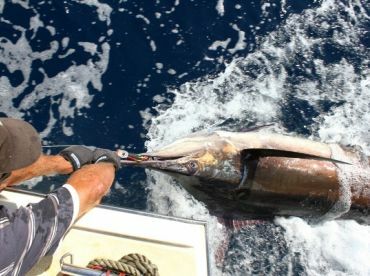 Good early start to get us into some serious fish - hit a black marlin an hour into the trip which was incredible. Captain and crew were very proffesional and the whole experience was fantastic.